A better harvest for Indian farmers – just a phone call away? A new CMF study explores the potential of a new mobile agricultural extension service to improve farming techniques. The Indian government has willingly implemented agricultural demonstrations as a method to develop farming knowledge and techniques. It spent $60 million on agricultural extension in 2009-10 alone. However, these traditional extension techniques seem barely able to deliver, as only 5.7% of a 270 million strong farming population report access to information delivered by these extension services (59th National Sample Survey). The alarmingly low usage of traditional agricultural extension does not come as a huge surprise if one delves into its logistics. Having government workers go individually to farmers to disseminate farming knowledge is time-consuming and given the costs involved suggests that not all farmers will be reached. Those who are reached may be the fortunate few who are well connected with the government or have sufficiently rich technical knowledge of farming. Even if marginalized and small farmers are reached, the quality of information that they receive may also be highly circumspect because government extension workers are often incentivized based on the number of farmers they reach. The high costs of transport into remote villages also mean that farmers may not be able to get timely, season-specific information about agriculture. The recent swift growth in the use of cell-phone based technology is a possible answer to the aforementioned problems of knowledge dissemination in agriculture. 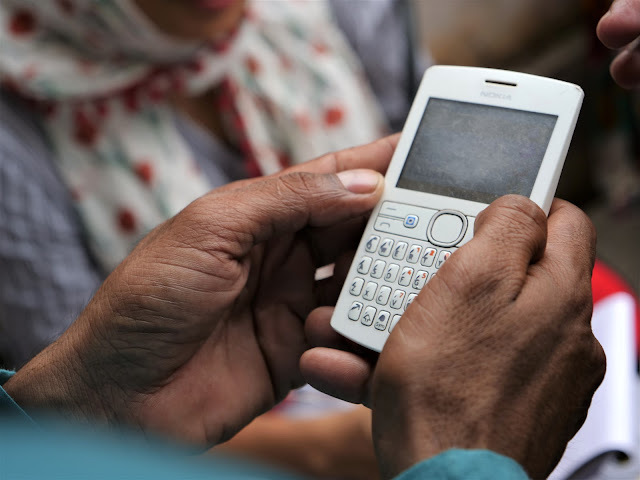 Cell-phones are a swift and extremely cost-effective way of delivering timely and customized information to hundreds of millions of smallholder farmers. To test the impact of delivering information using cell-phones, the Avaaj Otalo(AO) project takes help from an open-source, voice-based platform, Avaaj Otalo, and analyses its effect on farmers’ sources of information, their agricultural knowledge and their pesticide usage decisions. Avaaj Otalo’s technology is provided by Awaaz.De, a company developing information services that connect and engage rural, marginal, and underserved communities around the world. The project, a randomized controlled trial led by Shawn Cole of Harvard Business School and Nilesh Fernando of Harvard Kennedy School, is currently being conducted in two districts of Gujarat with 1200 farmers. In the study, one group of farmers receives traditional extension and mobile-based extension, another group receives just mobile based extension and a third group receive no advice. To participate in the study, farmers had to meet the following criteria : (a) be the chief agricultural decision maker in the household; (b) own or have regular access to a mobile phone; and (c) grow cotton. Participants in the mobile-extension groups receive push calls every week that broadcast season-specific agricultural information. Farmers can also dial into a hotline and ask their own questions that are answered by the project’s resident agricultural consultant (if they belong to the study group), or by external consultants working with the Development Support Centre, an NGO that implements AO across Gujarat. A midline evaluation of this intervention reveals that in the first four months of the service, approximately half of the treatment farmers called in to listen to information on the AO platform. There has been an increase in the number of treatment farmers who cite AO as their main source of information in making input-related decisions. Another encouraging result lies in pesticide usage and purchase data of the treatment and control farmers. Based on data from the first round of phone survey, one finds that the treatment farmers are making a conspicuous shift away from environmentally harmful and less effective pesticides to ones that are less harmful and more effective against the most dominant category of pests i.e. sucking pests. Although there is still much to learn from the analysis and results of the current survey, this project has already started showing signs of enriching our view about technology-based knowledge dissemination The project has the potential to go much beyond the purview of agriculture and have positive effects on farmers’ health status as they switch to pesticides whish pose lesser health risks. If this technology proves effective, scaling the project to include the entire farming population of India seems to be the right way forward. In fact, this open-source service could easily and cheaply be adapted to many other developing country settings, especially in Sub-Saharan Africa where rapidly growing mobile phone networks have presented a unique opportunity to revolutionize information delivery in agriculture.